So, I'm one of those people that gets behind, then gets overwhelmed, and instead of catching up, I just abandon ship. I owe so many posts and race recaps, but I'm gonna give a quick rundown and expand when time allows so I can feel free to post again without worrying about what I missed!!! -Texas Independence Relay (March 31-April 1). It was a phenomenal experience with 10 awesome ladies. I ended up running 5 legs in addition to the prologue and epilogue for a total mileage of 28.6 miles that weekend. It was hot, my team was amazingly supportive, and it was a great experience! - Not long after the relay was the downward spiral of issues... first dehydration led to massive calf cramps that lasted multiple days, which led to pulling an area behind my knee, which led to a much lighter running schedule for almost 3 weeks of recovery. I welcomed myself back with a night training run, but my weak leg lost it when I hit a root HARD on the trail and had to kneel down because my leg hurt so bad. I limped the remaining mileage to the car. - After 120 day running streak (at least 1 mile per day), I made the call that the injury was bad enough to take time off. I took 7 full days of rest. In all my time running, I've had some minor issues that caused 2-3 days of rest to heal up, but this is the first time I ever felt really injured. After the 7 days, I was on the right path to running again, but the hamstring I had pulled was still really weak and fatigued really quickly. - Zion 100 (May 10-13) - Coming off the injury, I knew I'd need to cut down my potential pacing mileage for Zion. I flew to Utah with Suann and her boyfriend, Martin. We had 4 amazing days of adventure. Suann ended up having a DNF due mostly to knee issues and horrid blisters at mile 63. She did amazing. It was 95 degrees in the desert with zero shade. Despite the fact that I didn't ultimately get to pace, crewing and accompanying her on that trip was a tremendous learning experience and I am so glad I went. You can read Suann's race report HERE. 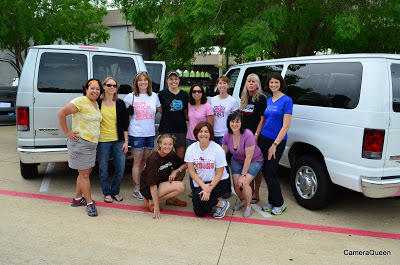 - Ironman Texas (May 18-20) - And last weekend I drove down with Shannon (IronTexasMommy) and Scott (Big Daddy Diesel) to go volunteer at Ironman Texas with Jeff (Dangle the Carrot), his wife Annie, and Jason's wife Karen. And of course the main reason we were there, to watch Jason (Cook Train Eat Race) become an Ironman!!! Watching that moment was indescribable! Congrats Jason. It was an amazing experience... we were there from swim start at 7am until the finish line closed at midnight. We volunteered in T2 for 6 hours in the middle of that. We were exhausted, and it was completely worth it! The last week of running has been good. I'm working my mileage back up, my leg is getting stronger. I don't quite have my pace or endurance back, but the pain is completely gone... and for now, I'll take that!! !